Experts in biochemistry, molecular biology, microbiology, proteomics, we develop technologies to detect biological targets (protein markers, microorganisms, etc.) based on recognised biological mechanisms (biosensors) for applications in human and animal health, environmental health, food traceability and safety. We adapt methods such as PCR and its variants (RT-qPCR, NASBA, HRM, etc.) to detect specific analytes. With respect to technologies based on antibodies, our work ranges from obtaining the antigen and developing the antibody to immunochemical tools like ELISA, immunofluorescence and Immuno-qPCR. We also work on their immobilisation on different kinds of surfaces (chips, particles, etc.) for their subsequent application in biosensors. We adapt these biological tests to portable/miniaturised systems, such as immunochromatographic stripes and systems of the Point-of-Care or Point-of-Test type for their use as analytical tools. Selection of specific markers and the obtaining of recognised biological molecules (mainly antibodies and nucleic acids). 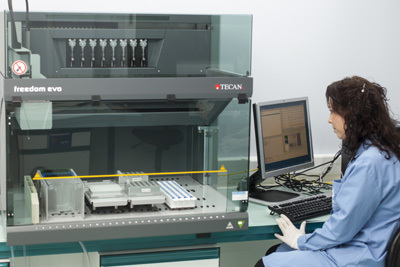 Development of lab-scale analysis tools based on nucleic acids and antibodies. Miniaturisation and adaptation of biological identification procedures: preparation of the sample, extraction and amplification of the signal. Development of fast immunochromatography (lateral flow) tests. Development of miniaturised devices based on the analysis of nucleic acids or antibodies.